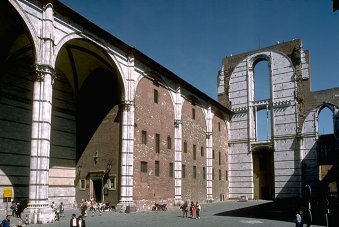 It was on a visit to Siena Cathedral in 1995 that I first realised my fascination with unfinished buildings. 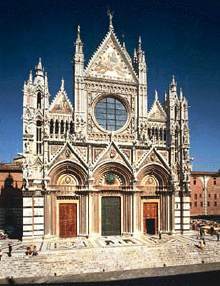 Siena's great cathedral was begun in the 12th century in the Romanesque style but was transformed in the 13th century into one of the finest examples of Italian Gothic. The walls and columns of the church's interior are covered with black and white marble, and its marble floors have decorative inlays by Domenico Beccafumi. About this time a huge extension was planned and work started in the year 1285. The extension was to be much bigger than the original cathedral but they have not got around to completing it. As can be seen in the right hand photo, some of the external walls were completed and one of the side aisles was roofed over (and later walled in to provide a museum). The foundations for the rest of the extension are visible but that's it. So don't ever complain again about your builder taking his time! The extension can just be seen to the right of the view of the front of the cathedral.